Travel Trailers such as 5th wheels that have a large overhang may need additional stability to provide adequate support. Like any other vehicle, it is prone to movement due to the suspension system. Besides the stabilizing jacks that are on the frame, there are other ways to keep your 5th Wheel from moving around. One such example is through the use of the FastJack Kingpin Tripod Stabilizer. This lightweight tripod stabilizer fits onto the kingpin and works well on any surface, including uneven ground. 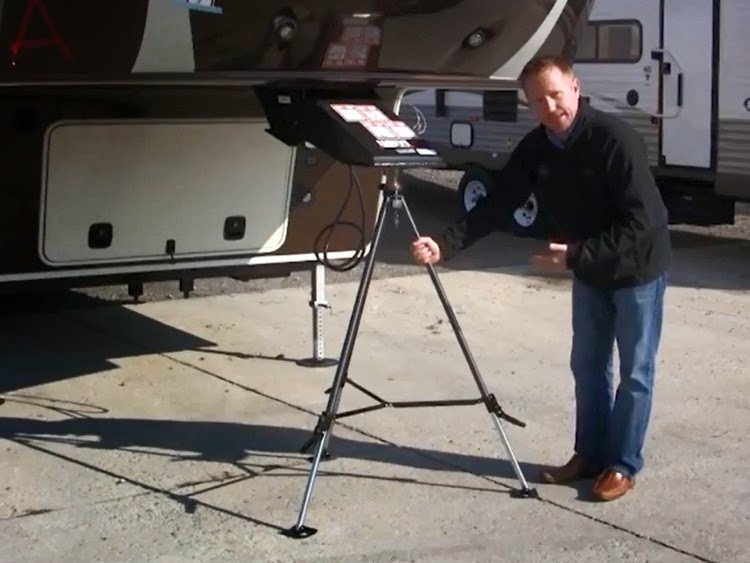 The FastJack Tripod can be set between 40 and 60 inches to support your trailer. Set up only takes a few minutes. Each leg can be independently adjusted and tightened for a custom support system. Once the tripod is set up, it is a good idea to walk around inside the trailer, so the tripod can settle. When it has settled, check to make sure the tension on each leg is still sufficient. Make sure you do not apply too much tension to the tripod. Removal is just as simple as the set up, once the tension is released the tripod can slide off the kingpin. This tripod helps to keep movement in your 5th Wheel down to a minimum, and works even in windy conditions. Having the extra support will also help to reduce stress on other parts of the trailer. It is collapsible for easy storage, and it comes already assembled so no time is wasted putting anything together. A padlock is included to keep the tripod secure on the kingpin. Keep in mind that the FastJack Tripod is not meant to be used for lifting or leveling the trailer.